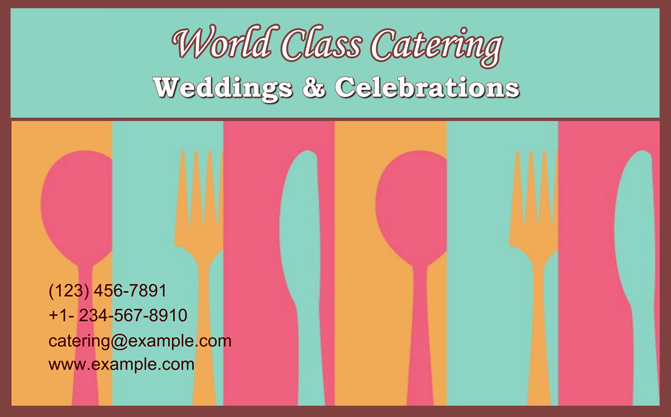 Catering Business Cards Templates – Download & Print! Advertising is a key word when speaking about promotion of a company. 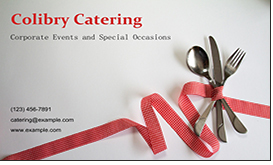 Usually, services like catering become popular due to the buzz marketing. When people hear about a catering company from people they trust, they are more likely to want to address to it themselves. But how do you start this chain of potential customers? What tool should you choose? 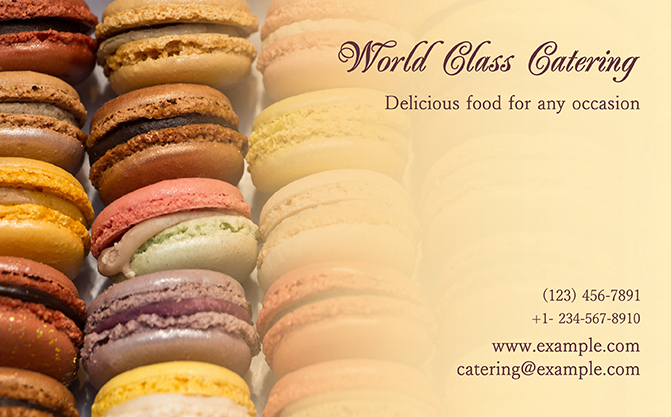 Customized catering business cards is the answer. A well-designed card will expand your client database and consequently boost your income. 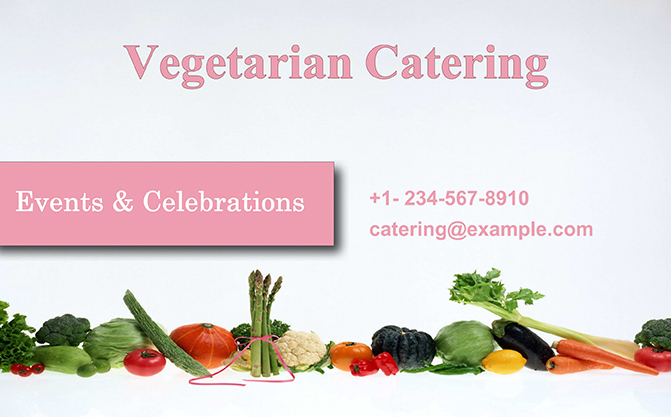 Whether you do beverage catering or vegetarian food catering, your company specialty and orientation should be mentioned in the card. The color scheme is of importance. If you are not sure what colors you should choose, rely on ready-made card templates with pre-adjusted palette. As catering service is frequently popular among the upper class, don’t forget to add a touch of elegance to your design using decorations, stylish fonts or even photos. Catering business cards will be eye-catching and informative if you use the best card making software suitable for the purpose, like Business Card Maker. 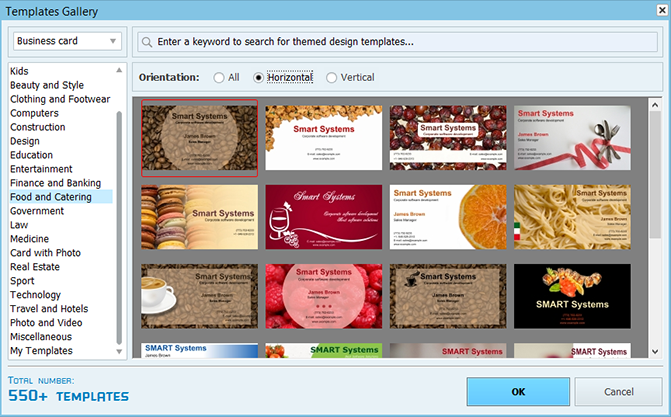 The software offers 550+ card templates among which you will certainly find your design. Business Card Maker has a clean and simple interface, you just need to select the template you like and then enter your information in the necessary fields. The card is ready to be printed, and you don’t have to do anything else, though all the design settings are perfectly customizable, and you can edit whatever element you wish. Now get acquainted with the following styles to find the one that fits your catering service best! A catering specialist should not just know how to prepare food, but how to make it look attractive. If you want to show your potential customers that you are all about quality and professionalism, make use of the traditional business card style. Business Card Maker offers a large variety of classic designs to choose from. You can personalize your card with text, images and your company logo. These designs may look simple at first sight, but their elegancy evolves gradually like the subtle flavor of a dainty dish that slowly changes to a luscious taste. Business Card Maker comes packed with a collection of clipart that you can use to refine your design. Play with borders and textured backgrounds that will make your card look as professional as possible. Yum yum! Juicy, bright and attractive - these styles are certainly to be the favorites as they produce the same effect as the set-out table full of delicious dishes. They make one's mouth water, and that is exactly what you need! Edit fonts and adjust the positioning of the elements on your card until your design makes you feel proud and satisfied. 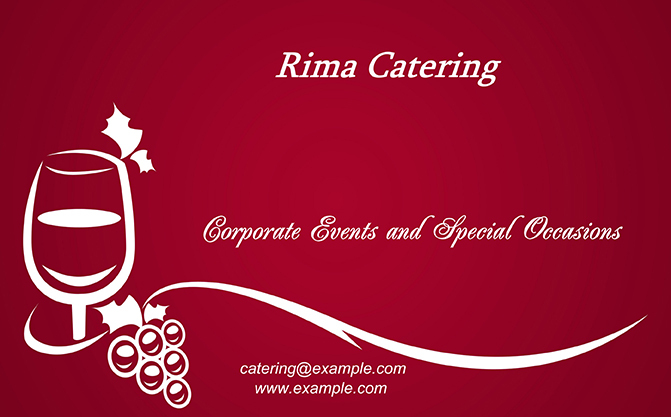 This particular style suits both beverage & food catering business cards. An elegant picture showing floral ornaments, grapes or wedding table decorations will charm the clients and make them want to work with you. This idea is especially well-loved among vegetarian food caterers and wine dealers. Business Card Maker allows creating a reverse side, so on the back of your card you can include a photo of your dedicated staff to show that all the food that you produce is prepared with love. If you want to keep your old customers coming back for another meal or event, the services you render should meet their requests. But if you want to gain new clients, your business card should be truly unique and professional. With Business Card Maker, designing such a card takes only a few minutes. So why wait and lose possible customers? Install the software now and head over to the templates to get started!